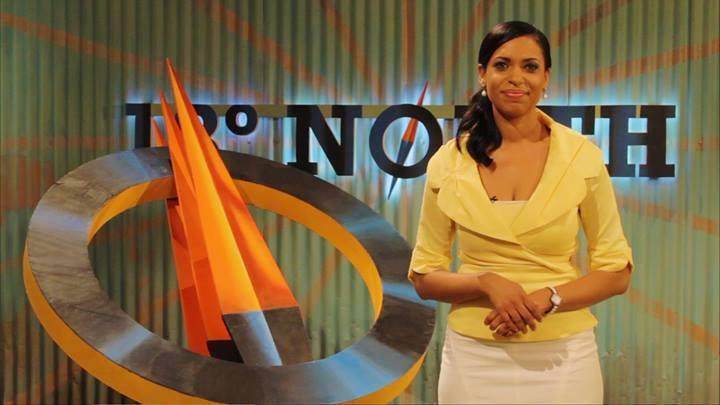 Zahra Burton Of "18 Degrees North" Aims To Make A "60 Minutes For The Caribbean"
Zahra Burton, host of "18 Degrees North"
Eighteen degrees north is the latitude where Jamaica and much of the Caribbean sit. It’s also the name of a new television newsmagazine show, perhaps the first to take an unflinching look at the problems and potential of the Caribbean. “18 Degrees North” is in its second season. It debuted in South Florida this summer, airing Sundays at 2:30 p.m. on CBS affiliate WBFS-TV, My 33. It’s hosted by former Bloomberg TV reporter Zahra Burton. Below, read an edited version of a phone conversation with her from Jamaica's capital, Kingston. You’re a Jamaica native. Why is this project – and telling Caribbean stories – so important to you, emotionally as well as professionally? I started my career in Miami and then came back to Jamaica and started covering the streets. It was such a colorful experience and I absolutely loved it. I went back to the States and pursued an international career. However, after a while, I wanted to do something that I felt was much more meaningful to my existence in the world as a Caribbean national. I always wanted to work at CBS “60 Minutes,” not going to lie, but never got the opportunity. So I started what I thought would be the “60 Minutes” of the Caribbean. And I think “18 Degrees North” really speaks to this idea of giving people a sense that the Caribbean is a lot more than just sun, sea and sand, and a lot more than just natural disasters, which is where we tend to appear in the news headlines around the world. Instead, we have other issues that we are dealing with, and [in] the global picture we should matter. You’re seen in 27 countries so far, but South Florida is home to the largest Caribbean diaspora community. So was it critical to get the show on the air here? It was extremely important for the show to get on mainstream television there in South Florida. What we want to do now is appeal to a much more global, more mainstream audience, not just Caribbean nationals. Your reports have dealt with matters in the Caribbean basin ranging from growing drug transshipment to burgeoning teen pregnancy. Are these issues Caribbean society itself has been hesitant to confront? I think what we try to do is look at the Caribbean from a global perspective. Last year we had done a story from the Dominican Republic [on] a decision that came out from the high court there that essentially stripped hundreds of thousands of people born there of their citizenship. Most of these happened to be of Haitian descent. What I did see happen as a result of that report [was] chatter on a regional level. Caricom [the Caribbean Community] suspended the Dominican Republic’s entry [into Caricom]. And so [the show] is having an impact. Now we just need to up the ante, and create a buzz on a global level. You also air culture and entertainment reports, like your recent interview with Guyanese actress CCH Pounder, who will star this fall in the new “New Orleans NCIS.” How do you battle the stereotypes of the Caribbean in that regard – you know, everyone playing steel drums on the beach drinking rum? [Laughs] Listen, we really don’t mind that stereotype. It’s a very enjoyable and unique place to live -- sunny all the time, a genuinely happy place to be. We do enjoy that part about ourselves. However, we do want to draw attention to the fact that we are a maturing set of societies. I didn’t even know CCH Pounder was of Guyanese heritage. So I’m also learning along the way. Is there a story you haven’t told yet that you want to? I think the biggest story I want to tell is an interview actually with Fidel Castro. That’s interesting. Would you be concerned about the reaction to that interview here in Miami? I think we are seeing a thawing of [U.S.-Cuba] relations. And so, as a result, maybe in Miami it would certainly create a stir, but I think to hear what he has to say is important, especially from an individual as notorious and iconic as he is. You founded the group Reporters for the Caribbean to produce “18 Degrees North.” Can you tell us about that? It actually started right there in South Florida. It all started to come together with the help of some really amazing minds, people in South Florida, in the Caribbean, in London as well. It was the idea of reaching out not just to Caribbean journalists, but journalists all over the world to report for the Caribbean. We’ll even have a story coming out of Russia this season. Christmas 2013 was the best and worst of times for Ralph Gonsalves. Gonsalves, Prime Minister of the Caribbean island nation of St. Vincent and the Grenadines, met with Pope Francis at the Vatican on Dec. 19. For Gonsalves, an outspoken populist who was about to take over as chairman of the Caribbean Community, or Caricom, it was a moment of valuable political cachet: Francis has proven a champion of poor global underdogs like the small republics of the Caribbean. On Christmas Eve, the islands of the eastern Caribbean were hammered by 15 inches of torrential rain. The flooding and landslides killed at least 13 people. South Florida’s Caribbean diaspora is gathering relief supplies - and officials are sounding the climate change alarm. Ralph Gonsalves, the prime minister of St. Vincent and the Grenadines, calls last week’s downpour “a disaster of a proportion…we have not seen in living memory.” Gonsalves himself lost a cousin killed in a landslide.